My nieces and I made these little guys today. The idea came from "No Time for Flashcards." 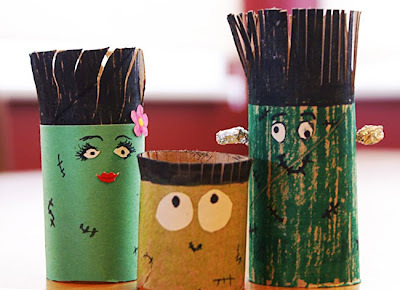 We experimented with construction paper (Frankenbride), crayons (Baby Franky) and markers (Franklin-stein). We didn't have any golf tees for the bolts, so we used rolled-up foil.